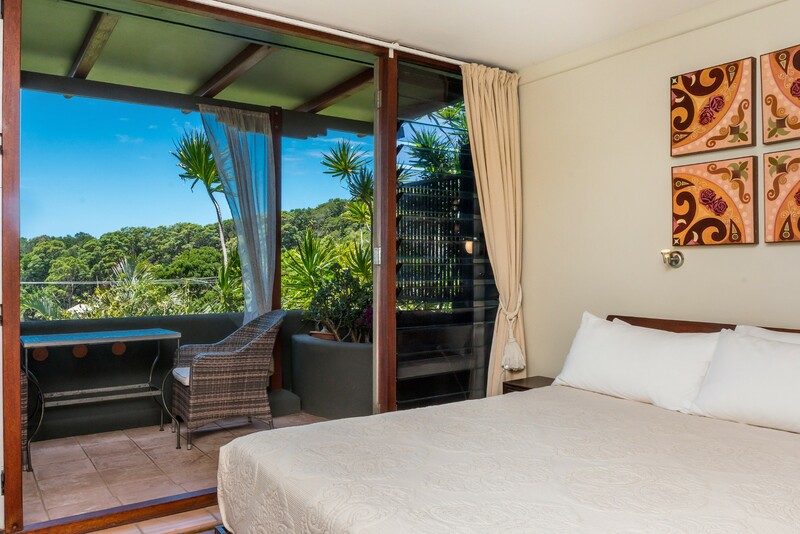 Wake up to stunning ocean views from this Cape Byron holiday rental retreat and look for surfing dolphins and tell-tale spouts of passing whales right from the comfort of your bed! 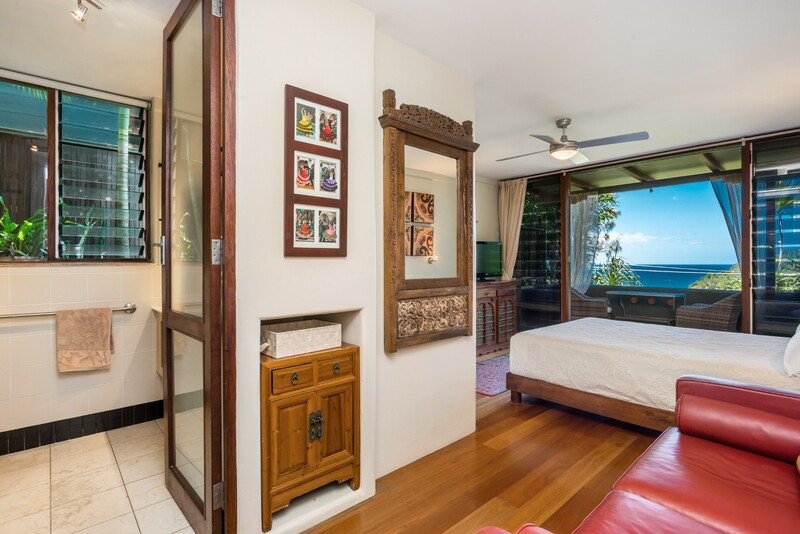 Wategos Retreats Studio offers cosy accommodation for two in an unforgettable position, tucked beneath Byron Lighthouse. The open-plan living space includes a kitchen recess, modern bathroom and ceiling fans which complement the sea breezes. Enjoy breakfast on the balcony drinking in the exceptional ocean views, watching playful pods of dolphins and spotting the occasional whale spout. Take a walk around the headland or stroll just 300m to the quiet sandy cove known only to the locals. 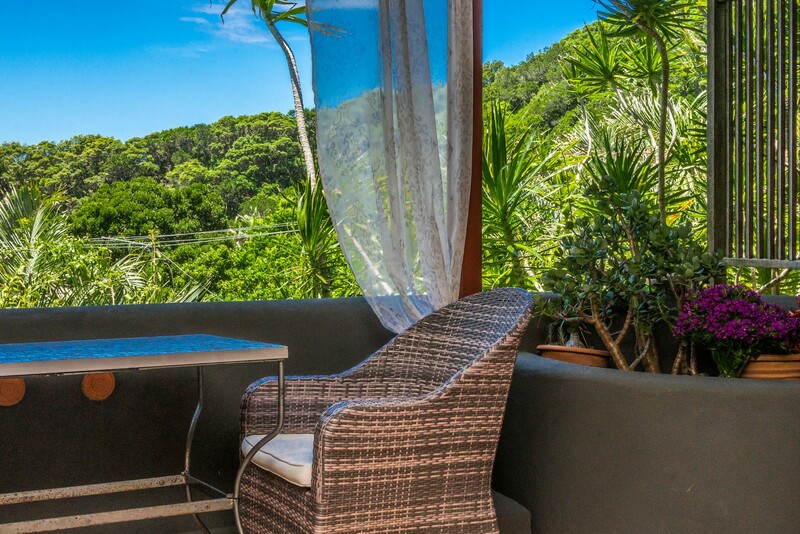 Swim, sunbathe and relax before freshening up and heading into downtown Byron. It’s an easy 3-minute drive or a 20-minute scenic stroll to the nearest shops, cafés and bars where lively nightlife and a choice of casual alfresco dining await. 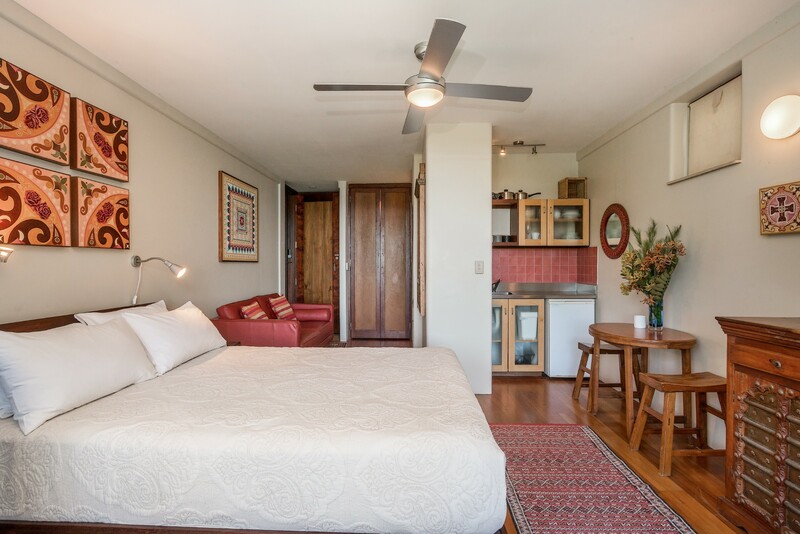 This cosy Byron Bay Studio at Wategos Retreats is more intimate than its neighbouring counterpart Wategos Retreats Apartment, and has a well-planned open layout with polished wood floors and everything you need for living, cooking, chilling out and sleeping. This unique escape provides stunning ocean views from almost every point in the studio.The kitchenette is perfect for fixing drinks and preparing breakfast which you can enjoy at the table in front of the picture window. Alternatively, dine al fresco and relax on cushioned chairs on the private balcony. Keep an eye open for surfing dolphins and breaching whales that frequent this coastline as you revel in this peaceful haven. Stay cool beneath the ceiling fans and head into Byron Town for supplies, entertainment and casual dining. After dark, relax on the leather sofa and make use of the Wi-Fi, TV and DVD player. 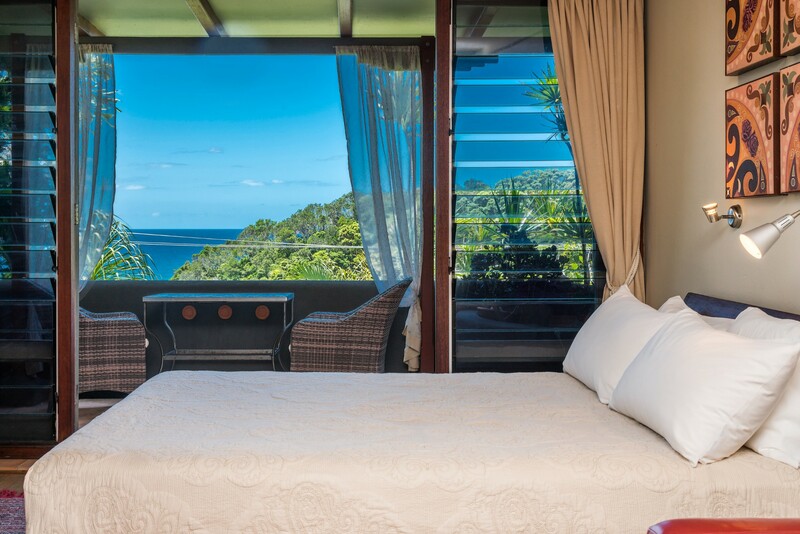 Odds are you’ll find yourself watching the mesmerizing ocean views instead from sun-up to moonlit night sky! This open-plan studio includes a comfortable queen size bed for two with quality bed linen and unsurpassed views through the picture window. 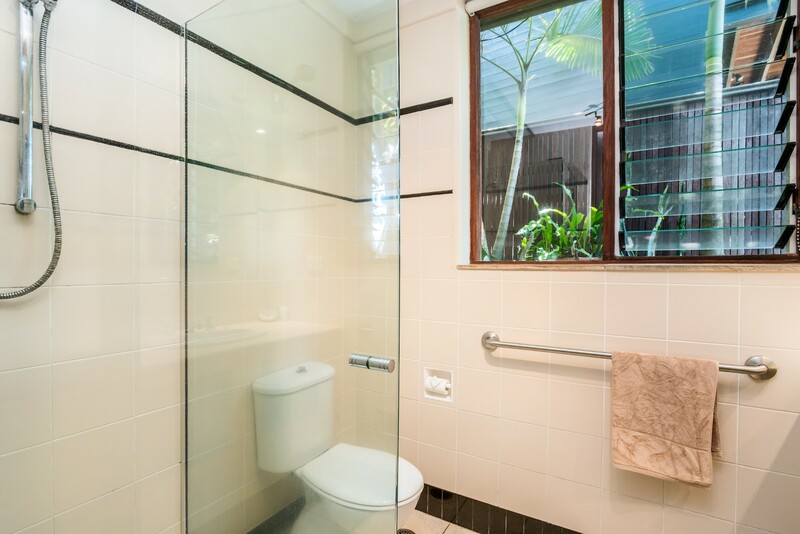 There’s a separate modern bathroom/wet room with shower. The private balcony is furnished with two cushioned chairs and a table. 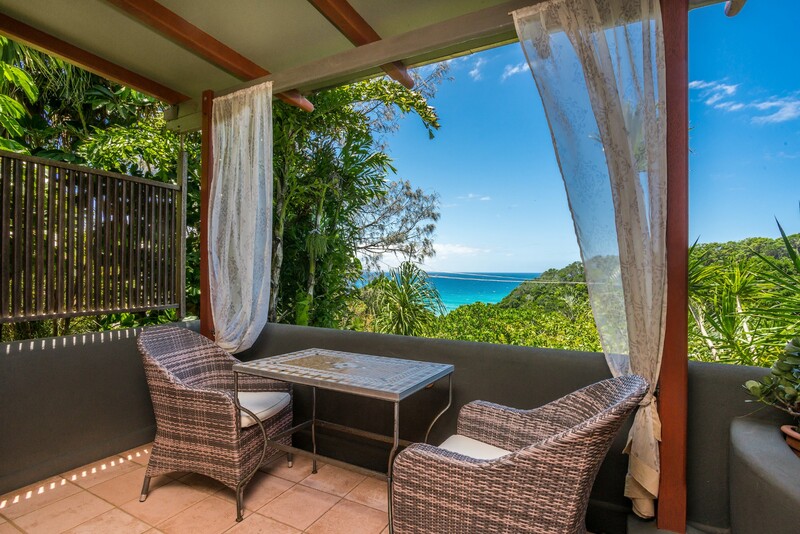 Enjoy the sounds of the ocean and stunning views as you read, relax and dine in this exclusive Byron hideaway. 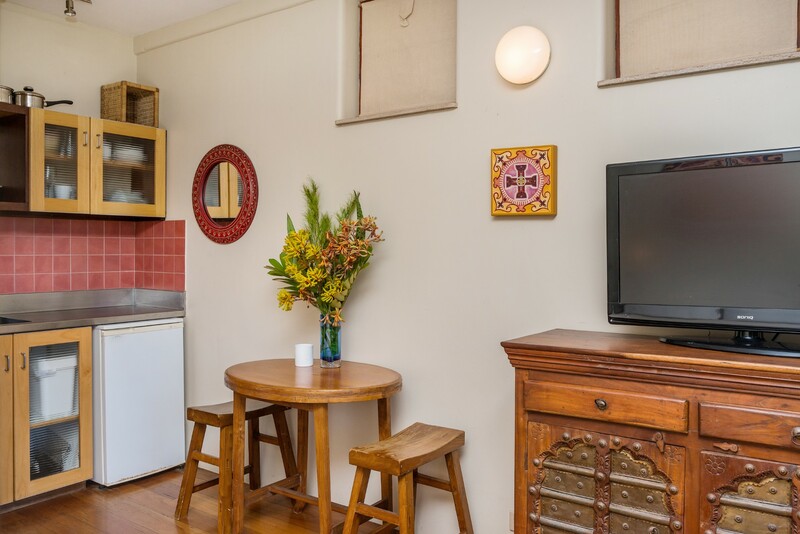 On-street parking is available at this Byron Bay holiday studio with a Locals Parking Coupon (provided). 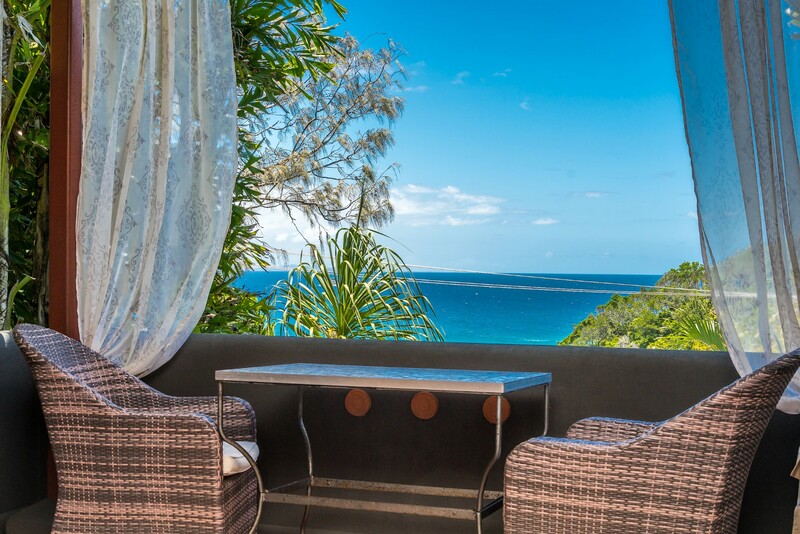 Located on Byron Headland, mainland Australia’s easternmost point, Wategos Retreats Studio is tucked beneath the landmark Byron Lighthouse. 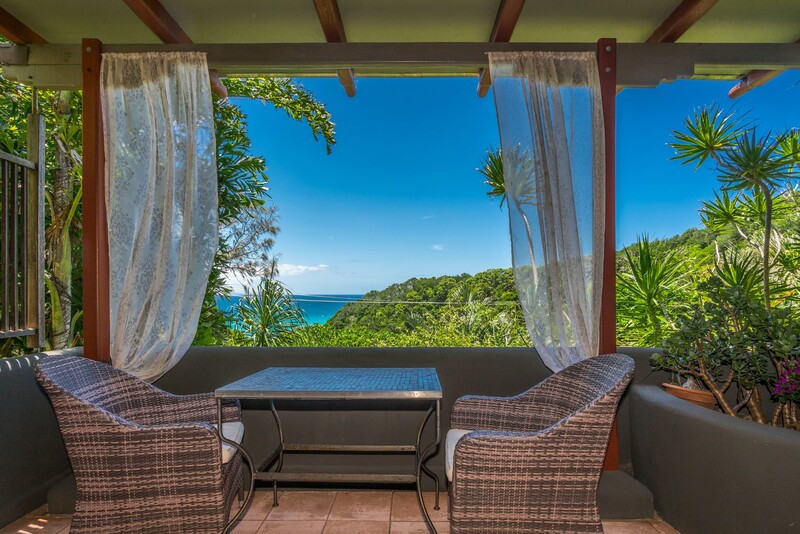 It enjoys unsurpassed views and is a short 300m stroll from the quiet sandy beach below. 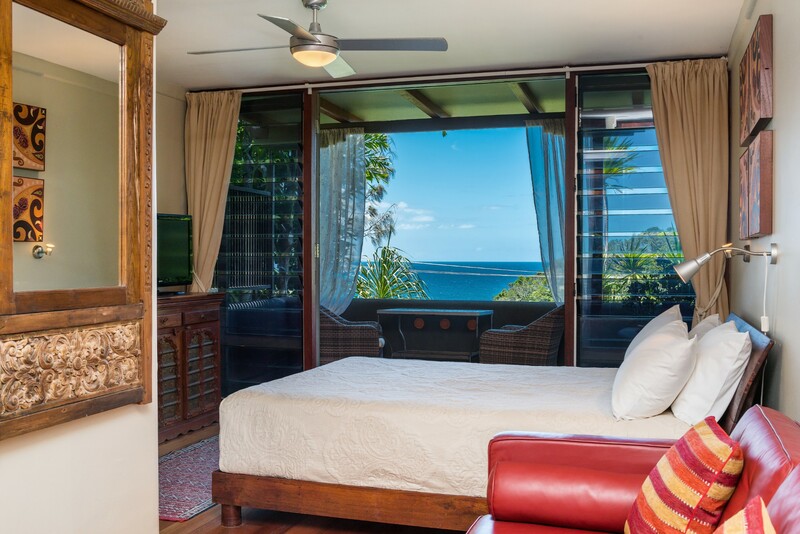 This enviably located studio is close enough to the water to spot playful dolphins and passing pods of migrating whales as they frolic offshore. The nearest shops, cafés and nightlife are just 3 minutes’ drive or a 20-minute stroll away in downtown Byron, which is 3.5km distance. A short drive into the Hinterland provides a delightful succession of historic villages, stores and taverns offering excellent dining and scenic walks into the rainforest. Nearby airports include Ballina/Byron Gateway Airport 36km away and the Gold Coast International Airport at Brisbane, 70km distance. We had such a lovely time at Wategos Studio. The location was fantastic as was the view, the studio was spotless and presented exactly as it does in the photos and the property manager was very personable and more than happy to accommodate us. Can't wait to go back! The property manager Lynne was so lovely! She was very responsive and was happy to accommodate our needs. The studio was absolutely spotless, and had everything we needed. The view and location were fantastic. We had a great time.